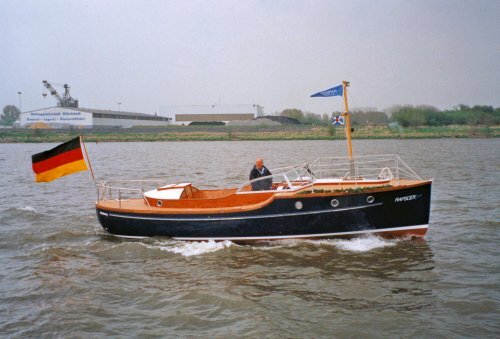 RAPSΩDY was commissioned by Max Weidtman in 1995, based on the designs of C. G. Pettersson, and had a hybrid propulsion system with an electric motor and the battery pack intelligently monitored and topped up by the Fischer Panda generator. The spelling of her name was to reflect the use of rapeseed oil for the generator. The project was taken over by a Dutch company who went on to develop a range of retro styled fast launches but dropped the eco-friendly original. Max’s prototype RAPSΩDY is shown here on her first sailing on his home river, the Elbe in Hamburg, in June 1996.